Last December, I was asked by the Connected Digital Economy Catapult to help them out scoping a possible Connected Products Studio. This is great fun for me as I have tangible experience of building connected products for installations, industrial applications and now the consumer market. The first thing Maurizio Pilu, the Catapult’s Director asked me to do is put together a consultation workshop where, instead of working in isolation, we would reach out to the possible audience or contributors to such a dedicated space. 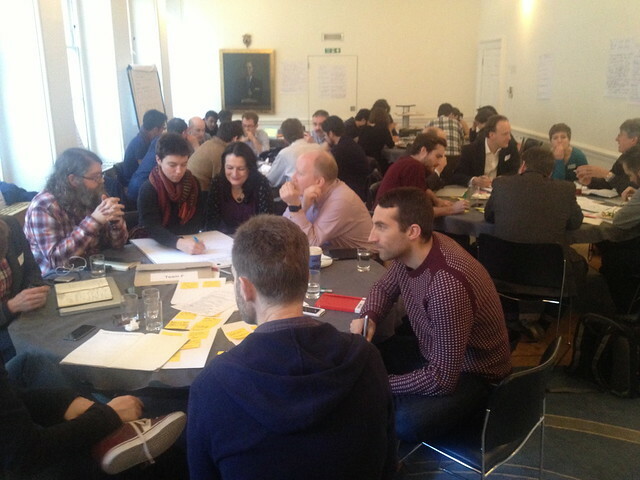 We ran this workshop last week at the Royal Society of the Arts and were extremely lucky to have attendees from the entire landscape of #iot in the room. I reached out to many friends of course and so did Pilgrim Beart who is helping shape the feasibility report with me. Consultants (Tom Armitage, Ben Ward, Lee Omar, Graham Hitchen, Georgina Voss, Nick Hunn, Paul Tanner), startups (Radfan, MyJoulo, KNRY, BleepBleeps, bergcloud), incubators (Bethnal Green Ventures), maker spaces (DoesLiverpool), SMEs (PAN Studio, Codasign, Soda, body>data>space, Flexeye, 1248.io, AlertMe, Xively) and corporations (Intel, Cisco, BBC R&D, Ogilvy Digital Labs, SapientNitro) came together and very generously spent the day with me teasing out what the key pain points were in developing a connected product. We then took those and tried to offer possible solutions with the skills in each of the teams. I’ve been to quite a lot of these workshops back in the days of the IOT Special Interest Group and wanted to live up to the work Graham and Rachel Jones had done. The crux of this landscape of pain points felt like it was a lot about meeting the right people at the right time in the process of commercialising a connected product which got me thinking about what a typical process looks like at the moment. I’ve also highlighted the opportunities that were brainstormed that day that felt like they might be totally new and not trying to replicate existing services. All these thoughts will go and feed the report I’ll be writing up for the CDEC in the next month or so. Fun times. Update: The full report is here. It might well be that you’ve got it covered, but one enormous contributing factor in getting a connected product off the ground is working with a team with the broad experience to successfully address the architecture and engineering of the connectivity. Working with a design consultancy is one possible solution to this, particularly for a startup with limited resources, or a product manufacturer unfamiliar with internet and communications technologies. Working with a consultancy can sound frightening, but is often cost effective and addresses time to market pressures. Here at Fen Technology, we are currently working on a project to connect a consumer product that historically has lived in its own unconnected world. We have been able to provide the specialised engineering capability and domain knowledge that is not part of the core skill set of our customer.